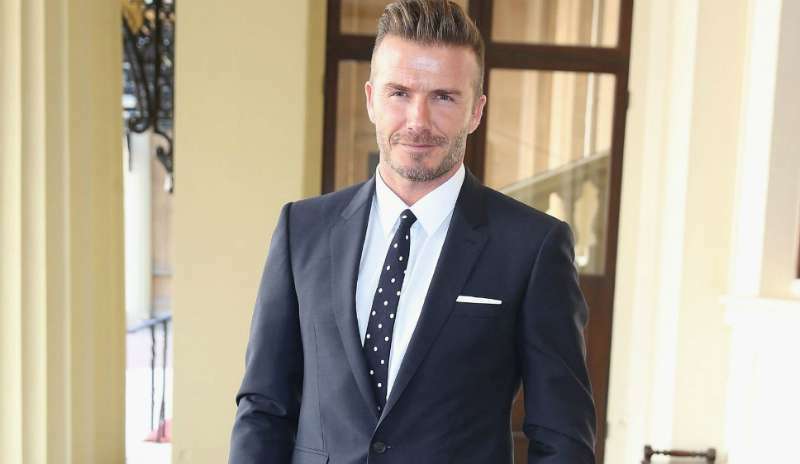 He might best known as a pro on the field, but David Beckham's style is just as impressive, especially when it comes to the way he pulls off a suit. Read on for our complete guide on how to wear a suit like David Beckham. Read more Mens Style Guide features. David Beckham is the nation’s most stylish man, and when it comes to getting suited and booted, few people do it as well as the footballer himself. David Beckham's style typically takes on a clean, tailored appearance, and he's the expert at taking classic pieces and bring out their full potential. Simplicity is key here, with fit being the most important factor in Beckham's suits. Wearing a suit might seem like an easy task, but there’s a significant difference between letting the suit wear you, and pulling off a clean look. We walk down memory lane and look back on Beckham’s many smart suited looks, as well as the best way you can pull them off. The two-piece suit can be found in any guy’s wardrobe. It's convenient, highly functional, and is comfortable to wear. As one of the simpler designs, it's important that it fits perfectly, as any areas that don't fit across the body will stand out clearly. David Beckham's suits are always in classic colours and cuts, with simple additions such as tie pins, pocket squares and various tie designs. He occasionally adds some print detailing on his shirts, but this is always subtle and never detracts from the suit itself. To emulate David Beckham's style start with a plain white dress or oxford shirt, making sure it's well fitted and long enough to tuck into your trousers. As his two piece suits are focused on fit rather than colours, make sure that your shirt matches perfectly to your body type and is slim, enabling a streamlined look when you overlay it with your jacket. For the suit, a black or navy colour is versatile and is appropriate for any situation, enabling you to match it with a variety of shirts and shoes. Just remember when you put it on to only do up the top button, as this will give a relaxed yet stylish finish. You don't have to spend a fortune on your suit to look sophisticated, so if you're feeling like the look is too simple, adding a bow tie and cufflinks will work wonders in creating a stylish outfit. The three-piece suit is an upgraded version of the aforementioned two-piece, and Beckham has been spotted repping the style on plenty of occasions. While the two-piece suit can be dressed down for more casual occasions, if you're looking to rock a three-piece - you really do need to have somewhere to go as it's really geared at towards the more formal end of the dressing spectrum. When tailored correctly, it's probably one of the most flattering ensembles for any body shape due to its clean lines and streamlined appearance. Anyone who's a little unsure about their body will benefit from the extra security of a waistcoat to help hide any extra bulk. Just remember the one rule of wearing a waistcoat - under no circumstances should you button up the bottom button. To create a clean and put together look, ensure that the colours scheme stays similar, choosing the same or similar coloured suit jackets, waistcoats and trousers to create fully realised look. If you're choosing something neutral like navy or dark grey, a white oxford shirt is a good choice to go for, with the light colour balancing out the darkness of the suit. If the look seems to plain you can always add a simple, unpatterned tie to give the outfit a more tailored appearance. However ditching the tie won't cause the look to fall apart, as the waistcoat will keep the suit smart and put together. Beckham is a big time fan of mixing and matching his tailoring separates to create unique, stylish outfits. When done correctly, you can create a look that gives off a more casual vibe, while still maintaining a smart, put-together appearance. The best way to achieve this yourself is to ensure that you're picking colours that match well together, so nothing too bright. Alongside this, a general rule is that your trousers should be darker than your suit jacket, this will help give a balanced look and ensure that you don't appear top heavy. You can go for a simple smart look by matching a slimline jacket and trousers with a neutral white shirt. If you want to add a tie, try to keep it the same colour as one of your pieces, rather than a new one. This will stop your outfit from having too many contrasting colours, and keep you looking sharp despite the unique suit combination. For a casual twist on the look, try out a slim line polo shirt instead of a shirt. A white polo is essential for the warmer months and, contrary to conservative styling beliefs, goes perfectly with a suit. Purchase one that is 100% cotton and as long as it’s impeccably ironed it will do justice to your suit. When it comes to dressing for an extravagant event, David Beckham's black and white tuxedo getups are right up there with the best of em'. The footballer is known for attending formal events where his choice of clothing inspire class and elegance. 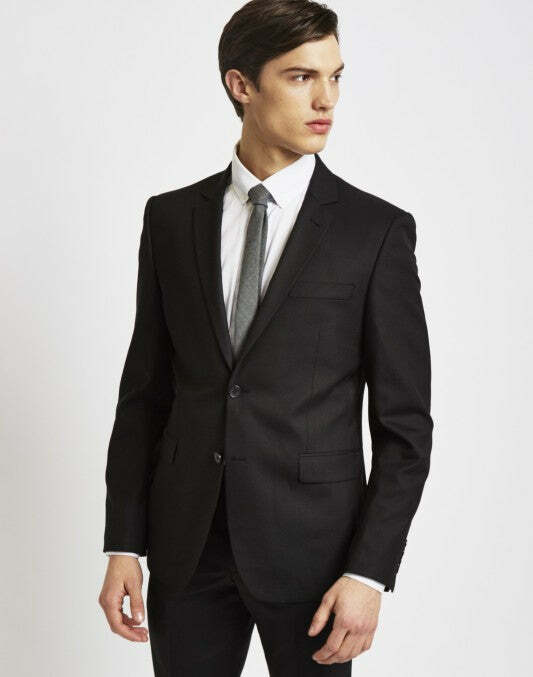 Undoubtedly, the most common black tie suit is the traditional suit with classic silk lapels. It’s always important to have a suit that fits the correct length, but a black tie suit has to be tailored to perfection. If you opt for a tie, remember not to wear a tie clip, and if you decide on a bowtie, check it regularly to make sure it doesn’t sit unevenly. For the shirt keep it simple with a white dress shirt that fits closely to your body, and make sure it's buttoned up to the neck. Black patent leather shoes are the only shoes to ever be worn at a black tie gathering, especially if you're opting for the traditional silk lapel jacket. You don't have to go for an expensive tailor-made suit, and there are plenty of suits you can buy that are affordable and fit the bill. As long as your suit fits your body properly, is long enough in the sleeve, and buttons up in the middle of the waist, then you'll look sharp and sophisticated without having to break the bank.